Makeup Remastered- reinvent yourself daily: Urban Decay Ocho Loco 24/7 Glide-On Eye Pencil Set - Holiday 2012 - get it before it's gone! 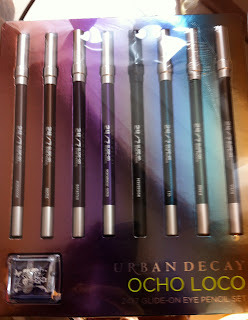 Urban Decay Ocho Loco 24/7 Glide-On Eye Pencil Set - Holiday 2012 - get it before it's gone! 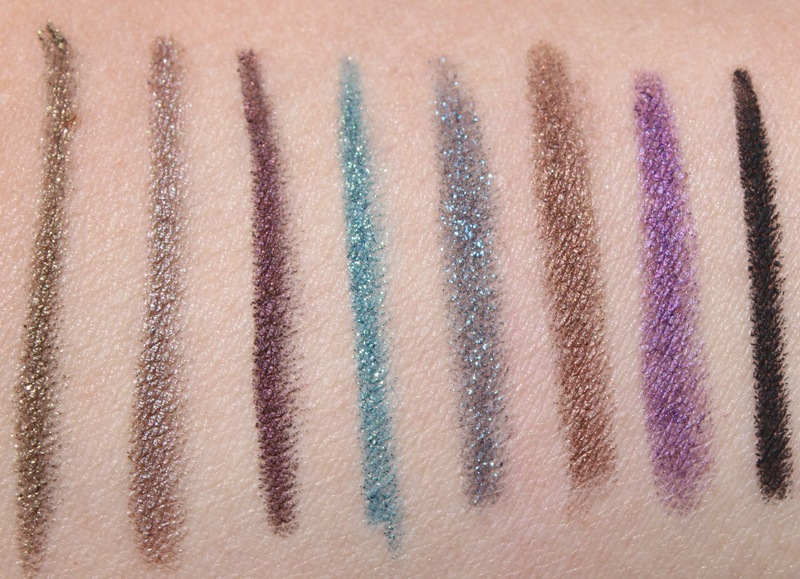 Urban Decay's 24/7 glide-on eye pencil sets are eagerly awaited each holiday season. They are my favourite long wearing liners. This set is so amazing as it as an array of colours from neutral to brights, and Perversion has been included, which will be a spare as this is my go-to 'blackest black' eyeliner. This is the best time to get these liners as the set was about 40 pounds and each liner individually sells for 12.97. So you are getting a set valued over 100 pounds. A perfect sharpener is also included which works well will these soft liners, and gives them a sharp, crisp point. A few of these shades are also limited. The picture below was taken in my hotel room, so please excuse the poor quality, as I need to discard the packaging for my trip home. The liner is a soft kohl type which does not tug or pull, not dissimilar to Makeup Forever liners. These colour go on intense as the colour you see in the pencil. They blend like a dream, then set for all day wear. These are perfect for your waterline as they are waterproof. This set offers a mix of finish as some have micro-glitter while others are matte. This set is a must. These liners will help you create so many looks with ease and you will be getting essentially four liners gratis. 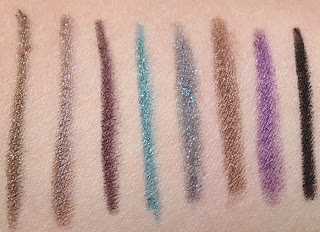 So Happy Holidays, make your eyes sparkle with these amazing liners from Urban Decay. Which is your favourite shade of Urban Decay 24/7 glide on eye pencils?